Microlepia speluncae (L.) T.Moore, Index Fil. : 93. 1857; Bedd., Handb. Ferns Brit. India: 67. 1883; E.Smith, J. Siam Soc. Nat. Hist. Suppl. 8: 3. 1929; C.Chr., Contr. U.S. Natl. Herb. 26: 332. 1931; Tardieu & C.Chr., Fl. Indo-Chine 7(2): 99. 1939; Sledge, Kew Bull. 11: 524 1956; Ching, Fl. Reipubl. Popularis Sin. 2: 243. 1959; Holttum, Rev. Fl. Malaya ed. 1, 2: 314. 1955 [‘1954’]; Holttum, Dansk Bot. Ark. 20: 24. 1961; Tagawa & K.Iwats., Acta Phytotax. Geobot. 23: 54. 1968; Tagawa & K.Iwats., Fl. Thailand 3: 118, f. 7.7 & 7.8. 1979; Boonkerd & Pollawatn, Pterid. Thailand: 88. 2000; Newman et al., Checkl. Vasc. Pl. Lao PDR: 26. 2007. 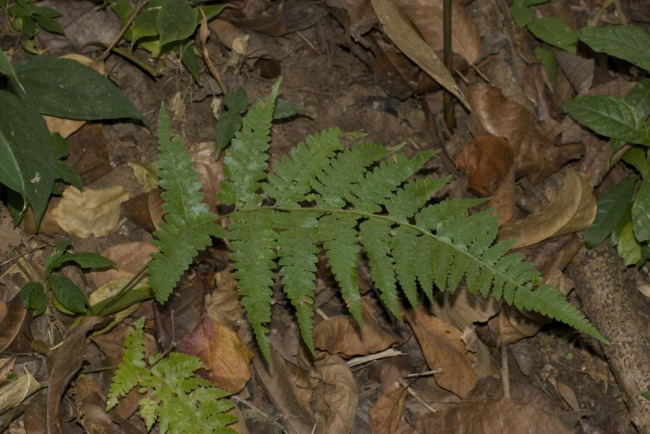 – Polypodium speluncae L., Sp. Pl. 1093. 1753. Microlepia hancei Prantl, Arbeiten Königl. Bot. Gart. Breslau 1: 35. 1892; Ching, Fl. Reipubl. Popularis Sin. 2: 236. 1959. – Microlepia speluncae var. hancei (Prantl) C.Chr. & Tardieu, Not. Syst. 6: 9. 1937; Tardieu & C.Chr., Fl. Indo-Chine 7(2): 100. 1939; Holttum, Rev. Fl. Malaya ed. 1, 2: 315, f. 182. 1955 [‘1954’]. Microlepia pilosula C.Presl ex Prantl, Arbeiten Königl. Bot. Gart. Breslau 1: 36. 1892; Tardieu & C.Chr., Fl. Indo-Chine 7(2): 97. 1939; Ching, Fl. Reipubl. Popularis Sin. 2: 245. 1959. Davallia polypodioides var. pubescens Hook., Sp. Fil. 1: 182. 1846. – Microlepia speluncae var. 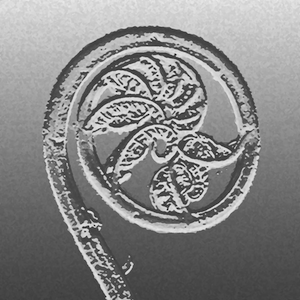 pubescens (Hook.) Sledge, Kew Bull. 11: 525. 1956; Tagawa & K.Iwats., SouthE. Asian Stud. 3(3): 81. 1965; Tagawa & K.Iwats., SouthE. Asian Stud. 5: 72. 1967. Microlepia speluncae var. villosissima C.Chr., Gard. Bull. Straits Settlem. 4: 399. 1929; Holttum, Rev. Fl. Malaya ed. 1, 2: 315. 1955 [‘1954’]; Holttum, Dansk Bot. Ark. 20: 24. 1961. Rhizome long creeping, almost naked in the older part, deep brown, more than 7 mm diam. Stipes stramineous or brownish, pubescent or glabrescent, 50–70 cm long; lamina large, tripinnate to quadripinnatifid, up to 70 cm long, 50 cm wide; rachis stramineous to brownish, grooved on upper surface, more or less hairy; larger pinnae oblong-subtriangular, broadly cuneate at base, broadest at lower second or third pinna, gradually narrowing towards caudately acuminate apex, with more than 20 pinnules, about 60 cm long, 20 cm wide; costa grooved on upper surface, more or less hairy, upper pinnae gradually reducing in size; larger pinnules oblong-subtriangular or oblong-lanceolate, gradually narrowing towards apex, unequally cuneate at base, up to 15 cm long, 3 cm wide, distinctly stalked, apical secondary pinnules (segments) a little protruding; segments lobed to pinnatisect, oblong to subquadrangular, round to acute at apex, unequally cuneate at sessile base, typically 1.5–2 cm long, 6–8 mm wide; ultimate lobes round or spathulate, round to acute at apex, entire or undulate at margin of larger ones; softly papyraceous to papyraceous, deep green above, green below, variously hairy on axes or on laminar surfaces; veins pinnate, veinlets once or twice forked, indistinct on both surfaces, variously hairy. Sori a little within the margin of lobes, small; indusia cup-shaped, hairy . NORTHERN: Mae Hong Son, Chiang Mai, Chiang Rai, Lampang, Tak; NORTH-EASTERN: Phetchabun, Loei; SOUTH-WESTERN: Kanchanaburi, Phetchaburi; CENTRAL: Nakhon Nayok; SOUTH-EASTERN: Chachoengsao, Chon Buri, Chanthaburi; PENINSULAR: Chumphon, Surat Thani, Phuket, Nakhon Si Thammarat, Trang, Satun, Narathiwat, Yala. Pantropical according to the current delimitation of the species . Usually on moderate, rather dry slopes in open areas or in light shade, most commonly at edge of thickets, up to 1200 m alt. The size of plants and form of pinnae and pinnules are very variable. Middleton et al. 4753, Kanchanaburi, Khao Laem National Park (E); Middleton et al. 4731, Chachoengsao, Ang Rue Nai Wildlife Sanctuary (E). Long et al. CL352, Mondulkiri (P).